Sharing with you homemade, lite, crusty pizza dough and one of my favorite caramelized onion topping recipe. 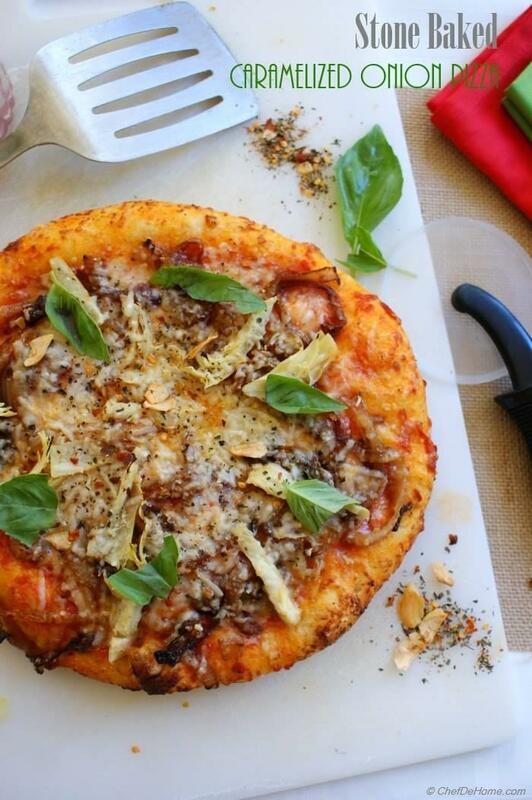 This pizza will make you love cooking at home even more. 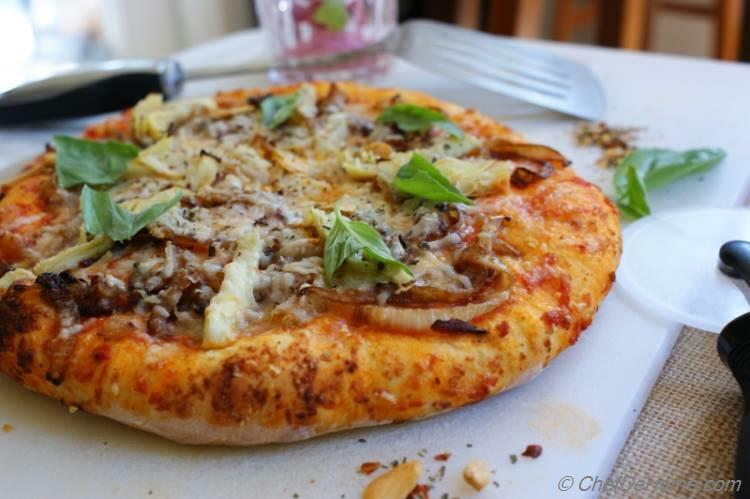 Made from scratch pizza dough with melt-in-mouth sweet caramelized onions, buttery parmesan and juicy tomato marinara sauce will make pizza making at home - A gourmet experience!! Do you make pizza dough at home? Well, many of my friends buy pizza dough or par-baked pizza crust from store and its totally fine if you do the same. It saves a lot of time, right? These days my friends are asking me to share made-from-scratch pizza crust recipes. I make a few kinds of pizza crusts at home. Today I got to share one with you all. This recipe is the one I love most - fluffy and crusty. When I started baking at home regularly, one of the first thing I made at home was Pizza Dough. You will believe me (I am sure), that nothing can beat taste and texture (and to me, the satisfaction) of homemade pizza, made from scratch. Once I learnt to make good pizza crust at home, I never let Vishal buy pizza crust (at least) from store. Frozen pizza dough, however, is an exception. When I don't have time or don't have homemade pizza dough frozen then I do opt to buy frozen pizza dough. The best bet is, make sure to knead some extra pizza dough while planning for a pizza night and then freeze a portion or two for next time. It really saves time and money. I have made this pizza dough a thousand times now. I thought it is perfect to share it with you all. I mean, look at the picture. Don't you think it looks tempting, fluffy and mouthwatering good!! Toppings for this pizza have special relevance. I always try a few toppings on homemade pizzas to let taste of crust shine-through. Today, I chose sweet caramelized onions with briny artichoke hearts, juicy marinara sauce, and topped it with salty Parmesan cheese. Sweet, briny, salty on a fluffy and crusty homemade pizza, so scrumptious!! For even cooking and rustic texture, I baked pizza on pizza stone. 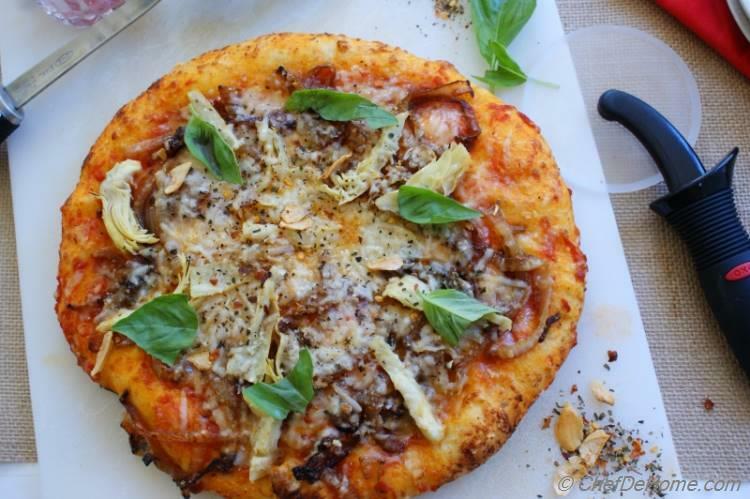 Even though pizza stone is recommended, its not mandatory to make this pizza. I baked this pizza on pizza sheet tray a hundred times. If you are a regular visitor of my blog then you know, pepper flakes on savory dishes is like cherry-on-top for me. Today, I topped my pizza with pepper flakes and Italian seasoning mix (which had some crispy garlic flakes). Yummy!!! Feel free to skip the peppers/seasoning but I recommend using'em. 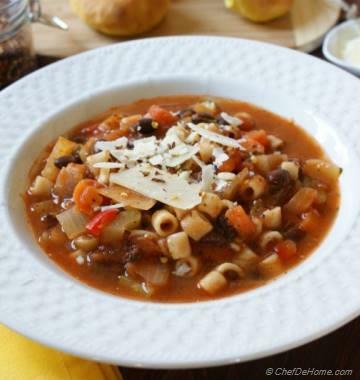 Little kick of pepper flakes with rich and buttery parmesan cheese and sweet onions is like piece of heaven in every bite!! 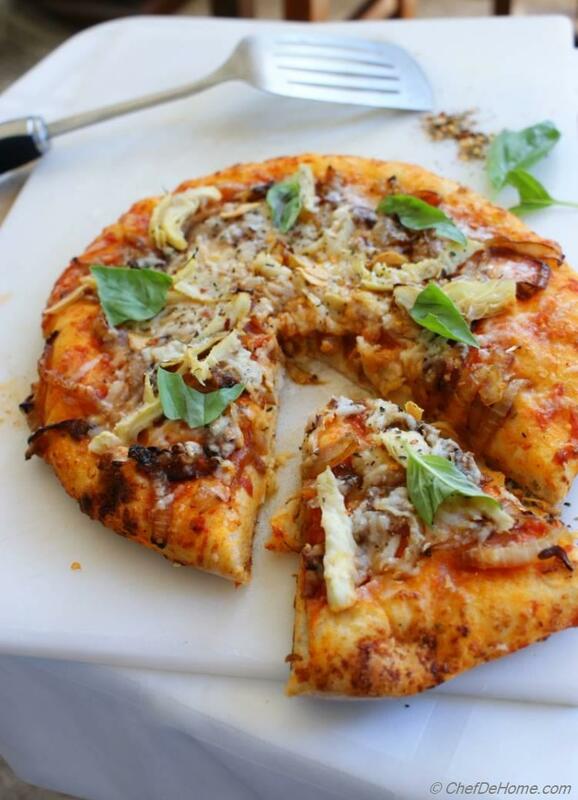 Enjoy made-from-scratch pizza and answer my one little question - what toppings do you like on your homemade pizza? 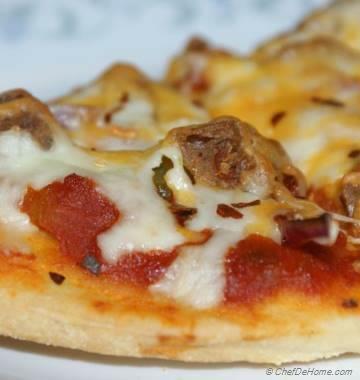 Smart Swap Use store-bought frozen/fresh dough or ready-made pizza crust to ready pizza in minutes. 1. Make Pizza Dough - Spread yeast and 1 tbsp sugar in 1/2 cup lukewarm water and let it foam up for 10 minutes stir once in between. In a bowl, add 2.5 cup flour, olive oil, oregano, 1/2 cup lukewarm milk, yeast mixture and salt. Now add ¼ cup flour at a time till dough comes together.Transfer dough to a work surface and knead for 5 minutes (at-least). 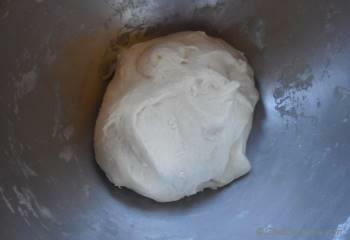 Transfer dough to an oiled bowl, turn upside down, so that dough is completely covered with oil. Cover and let it rise at warm place for 1-2 hrs or until double in size. 2. Punch the risen dough, transfer to a flour dusted work surface. Knead for 2 more minutes. Leave aside the dough to rest. Cover with dry kitchen towel. 3. In a large skillet heat oil over medium heat. 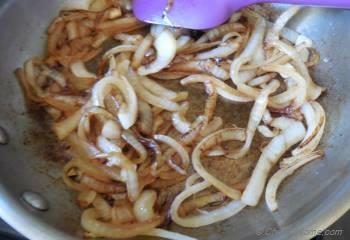 Add onions and sugar; stir to coat. Cook about 20 minutes or until onions are browned and caramelized, stirring occasionally. 4. Divide pizza dough in half. 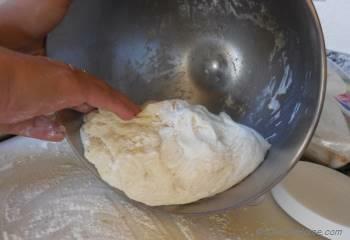 On lightly floured surface, roll out each dough half into a round circle of 8 inch or bigger if you like thin crust. Preheat oven 475 degree F. Lightly grease two large baking sheets. 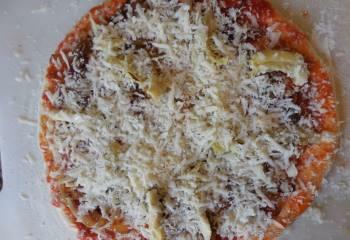 Divide caramelized onions, marinara sauce or (drained tomatoes, if using), artichokes evenly on the dough base. 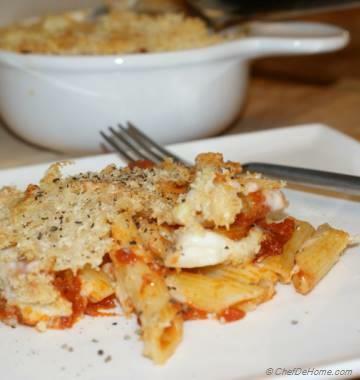 Spread with Parmesan cheese. 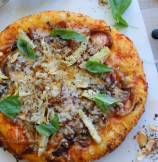 If using Pizza Stone, transfer the rolled pizza dough on stone and then layer the toppings. Stone baked pizza cook more evenly and gets very crusty from bottom. So lift crust with a flat spatula after 10 minutes to ensure its not burnt. 5. Bake for 12-15 minutes or until crust is golden brown and crisp and cheese is all melted and even. Sprinkle red pepper flakes (if prefer) and enjoy!! Pizza stone will need lesser time, only 10-12 minutes. Lovely Pizza... Looks and sounds great! I just love pizzas! Ritu, thank you so much!! One of my reader friend on google+ said, it looks like Tandoori Chicken topped on a pizza!! Even though this is vegetarian pizza, but Tandoori Chicken pizza sounds a great idea to me, I might make one soon, keep checking back! !